We have noticed that many VW TDI’s are not getting the maintenance they require, leading to expensive repairs and breakdowns. TDI timing belts must be replaced on time or very expensive damage can occur when it breaks! In the front of your owner’s manual there is a maintenance schedule that shows what maintenance needs to be done when. On most TDIs the timing belt needs to be replaced every 60,000 miles, but it may be required as frequently as every 40,000 on early cars with automatic transmissions (1998-2000), or up to 100,000 miles on some TDIs from 2003-onward. Check your manual and service records to make sure you know when yours is due. If you bought your car used and don’t know if the timing belt has been replaced or what maintenance has been done we are happy to check it out for you. We provide expert, biodiesel-friendly auto repair and service for TDI’s and all diesels from Benzes and older VWs to Jeeps and Powerstrokes. We are one of the most experienced automotive diesel repair shops in the area and I am a national expert and trainer in Biodiesel mechanics. Almost every week we save our customers thousands of dollars in repairs recommended by other shops and we probably work on more TDI’s than anybody including the dealers. Biodiesel is wrongly blamed for emission testing failures, injection pump failures, plugged intake manifolds and turbos, leaking hoses and seals, and more! We can prevent and repair most of these problems quickly and cheaply. 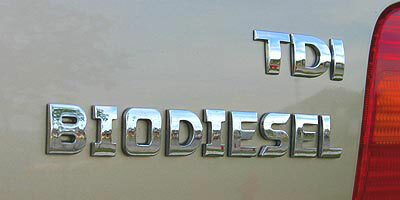 TDIs are fantastic vehicles and love biodiesel, and they are not expensive to own as long as you stay on top of the recommended maintenance and fix problems before they can cause additional harm. However, time is going by and these cars are getting older! As they age, we have been starting to see more frequent issues with a number of components. We have been seeing more and more mass airflow and coolant temp sensors going bad on 1998-2003 cars, fuel pickup valves sticking, electric fuel pumps dying on 2004-2005 Golfs and Jettas, and several other common issues. The onset of symptoms of these problems is often gradual, so they can sneak up on you. When you are driving the car every day it is difficult to notice subtle changes in its operation. It is important to pay attention and have the car checked out occasionally in order to keep your TDI happy and avoid big repair bills. If you catch these issues early on when they first arise, the repairs are quick and cheap — but if you let them go too long, they can cause damage to other components and then the repairs start to get expensive. If your car doesn’t have as much pep as it used to, is getting harder to start, has a check engine light on, or is showing any other sign of needing help, be sure to have it checked out sooner rather than later so we can address the problem before it becomes more serious. The two keys to being a happy biodiesel user are good, local, sustainable fuel and a healthy car! Awareness and prevention are your main tools. Give us a call or stop in next time you fill up if you need to schedule an appointment for service. There are several videos which explain many of the common TDI maintenance issues and how to deal with them. We also encourage you to share some of your own stories about biodiesel, maintenance and your TDI on our Dr. Dan’s Facebook page. Have a great summer and thanks for supporting sustainable biodiesel! This entry was posted in Auto Repair, Uncategorized and tagged auto maintenance, auto repair, biodiesel, TDI, timing belt, VW. Bookmark the permalink.